No matter how naturally beautiful your hair is, you’d want to style it at some point of time. Most of the people stay away from styling their hair because they fear if they’ll damage it. There are some other people who will style their hair anyway and end up having bad hair fall due to damage and breakage. Just because styling your hair cause damages it, you need not stay away from changing your hairstyles. People with wavy and curly hair types always crave for silky straight hair and people with straight hair often buy curlers. It’s always that way because we love to try out new looks. Here are a few tips that will help you get straight and styled hair without damaging it. If you’re a person who straightens your hair every once in a while it is utmost important that you provide nourishment to your hair regularly. One of the best things that you can do for your hair is a healthy hair mask every week. Trust me; it’s not as difficult as you think. You may visit a salon for getting a hair mask treatment but doing it every week can be pretty heavy on your purse. But don’t worry because there are many natural hair masks that you can prepare by yourself at home. Avocado, onions, bananas, milk, yogurt, green tea, lemon juice, and apple cider vinegar are some of the most useful ingredients that you can add to your hair mask. Before you straighten your hair, prep your hair by washing it with a good shampoo and a nourishing conditioner that will help you beat damage. Check out the reviews of the shampoos and conditioners available in your area and find out the ones that will suit your hair the most. Once you completely dry your hair, apply a good heat protectant spray on your hair before you straighten it. Heat protectant spray is a must use product every time you run a straightener through your hair if you rarely straighten it. Such sprays will keep your strands away from damage, helps them look shiny, and repair any damage that’s already there. Separate your hair into different sections that can be straightened in one go with the help of hair clips. This is very important because this way you can concentrate well on each part separately and you will not straighten the same hair again and again. No matter what you prefer, a flat iron or a straightener brush makes sure that you get a good quality one. 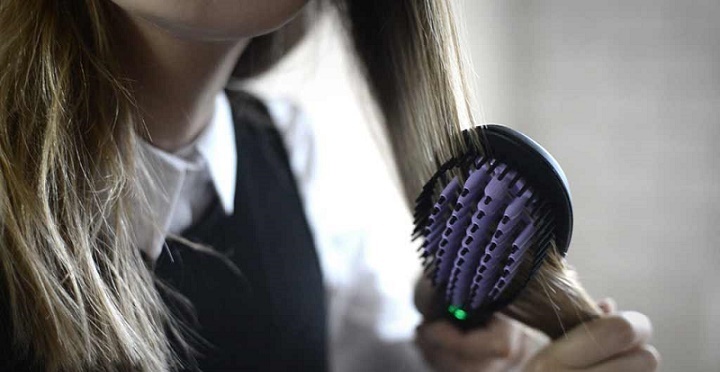 From Curly to Straight with the HerStyler Straight Brush Pro is an example for a good quality straightener brush. Use a good hair serum after you straighten your hair. Hair serums will keep your hair healthy and make them look shiny and smooth. They give the perfect finishing your hair requires after being straightened. Massage your hair with coconut oil, almond, oil, or a mixture of essential oils before you wash your hair. This will add life to your hair and keep your scalp healthy.